Answering questions via his twitter account yesterday, Elon Musk confirmed that the Model 3 will get Ludicrous Mode option similar to the Model S and X. Musk revealed during the unveiling that the Model 3 will do 0-60mph in under 6 seconds and will have at least 215 mile range starting from $35,000. Ludicrous Mode, if installed on current models, decreases 0-60mph by 10%, and depending on the model, an upgrade can cost up to $10,000 to retrofit. 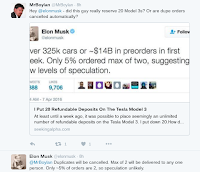 Meanwhile, Rick was able to reserve 4 orders on the Model 3 himself suggesting "It’s possible some Tesla fanatics are ordering multiple Model 3s they’ll never buy, inflating the number of pre-orders". 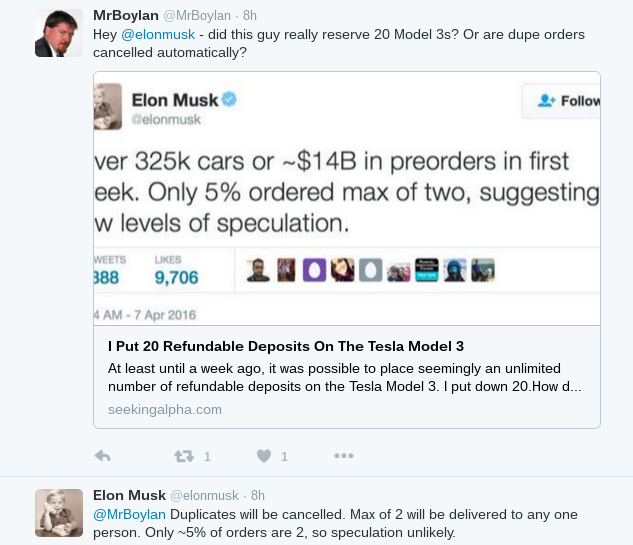 However Elon responded to the claims swiftly by noting that Tesla's system scan detected and purged 0.2% with same email/physical address, confirming that maximum of two Model 3's will be delivered to any one person/address, noting that only 5% of the total reservations were orders of two, therefore the 400,000 reservations are not inaccurate. 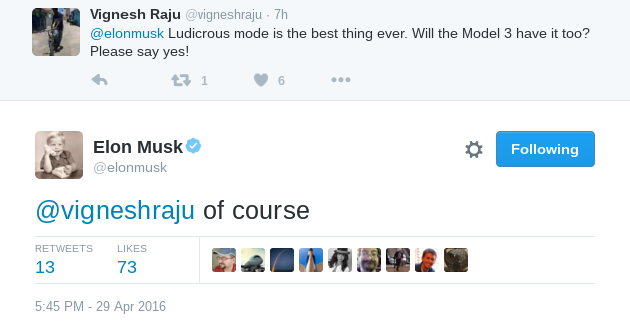 On another note, Elon confirmed that more cowbells will be coming via software update soon. 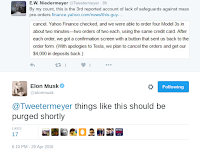 Cowbells were recently introduced as a hidden Easter egg surprise for Tesla owners by tapping the autopilot function four times in quick succession launching a "more cowbell" feature, then the dashboard display would change to a psychedelically-flashing rainbow road and the famed tonk tonk tonk of Blue Oyster Cult’s “Don’t Fear the Reaper” fills the car. 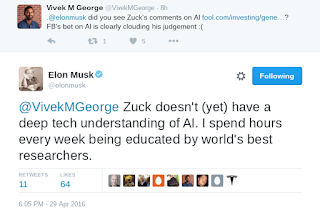 Before ending his twitter Q&A, Elon had few words to Mark Zuckerberg's recent interview about AI when he said "... machines that we build serve humans so unless we really mess something up I think it should stay that way." suggesting that Mark doesn't "yet" have a deep tech understanding on AI, claiming "I spend hours every week being educated by world's best researchers." The base Ξ will be under 6 sec. The upgrade/bigger pack will be less than 4 sec.